You are here: Home » Faith » Focus on Faith » Saint or sinner? What are we ultimately: saints or sinners? What’s deepest inside us: goodness or selfishness? Or, are we dualists with two innate principles inside us, one good and one evil, in a perpetual dual with each other? Certainly, at the level of experience, we feel a conflict. There’s a saint inside us who wants to mirror the greatness of life, even as there is someone else inside us that wants to walk a seedier path. It’s because of this tension inside us that we find it so hard to make clear moral choices. We want the right things, but we also want many of the wrong things. Every choice is a renunciation, and so the struggle between saint and sinner inside us often manifests itself precisely in our inability to make hard choices. But we don’t feel this tension only in our struggle to make clear moral decisions; we feel it daily in our spontaneous reaction to situations that affect us adversely. Simply put, we are forever bouncing back and forth between being petty and being big-hearted, spiteful and forgiving, whenever we are negatively impacted by others. For instance, we all have had this kind of experience: We are at work and in a good emotional state, thinking peaceful and patient thoughts, when a co-worker comes in and, without good reason, slights or insults us in some way. In one instant, our whole inner world reverses: A door slams shut and we begin to feel cold and spiteful, thinking anything but warm thoughts, seemingly becoming different persons, moving from being big-hearted to being spiteful, from being saints to entertaining murderous feelings. Which is our true person? What are we really, saints with big hearts or petty, spiteful persons? Seemingly, we are both, saints and sinners, since goodness and selfishness both flow through us. Interestingly, we don’t always react in the same way. Sometimes in the face of a slight, insult, or even positive attack and injustice, we react with patience, understanding, and forgiveness. Why? What changes the chemistry? Why do we sometimes meet pettiness with a big heart and, other times, meet it in kind, with spite? Ultimately, we don’t know the reason; that’s part of the mystery of human freedom. Certain factors obviously play in; for example, if we are in a good inner-space when we are ignored, slighted, or unfairly treated, we are more prone to react with patience and understanding, with a big heart. But, be that as it may, ultimately there’s deeper reality at work in all of this, beyond our emotional well being on a given day. How we react to a situation, with grace or spite, for the most part depends upon something else. The Church Fathers had a concept and name for this. They believed that each of us has two souls, a big soul and a petty soul, and how we react to any situation depends largely upon which soul we are thinking with and acting out of at that moment. Thus, if I meet an insult or an injury with my big soul, I am more likely to meet it with patience, understanding, and forgiveness. Conversely, if I meet an insult or a hurt while operating out of my petty soul, I am more likely to respond in kind, with pettiness, coldness, and spite. And, for the Church Fathers, both of these souls are inside us and both are real; we’re both big-hearted and petty, saint and sinner. The challenge is to operate more out of our big soul than our petty one. But we must be careful to not understand this dualistically. In affirming that we have two souls, a big soul and a petty soul, the Church Fathers are not teaching a variation of an old dualism, namely, that there are inside us two innate principles, one good and one evil, perpetually fighting for control of our hearts and souls. That kind of struggle in fact does go on inside us, but not between two separate principles. 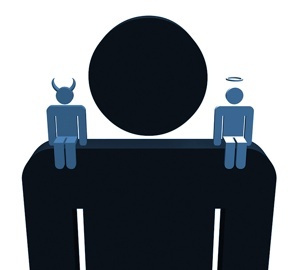 The saint and sinner inside us are not separate entities. Rather the saint in us, the big soul, is not only our true self, it’s our only self. The sinner in us, the petty soul, is not a separate person or separate moral force doing perpetual battle with the saint, it’s simply the wounded part of the saint, that part of the saint that’s been cursed and never properly blessed. And our wounded self shouldn’t be demonized and cursed again. Rather it needs to be befriended and blessed — and then it will cease being petty and spiteful in the face of adversity. Father Rolheiser, a member of the Missionary Oblates of Mary Immaculate, is president of the Oblate School of Theology in San Antonio, Texas.